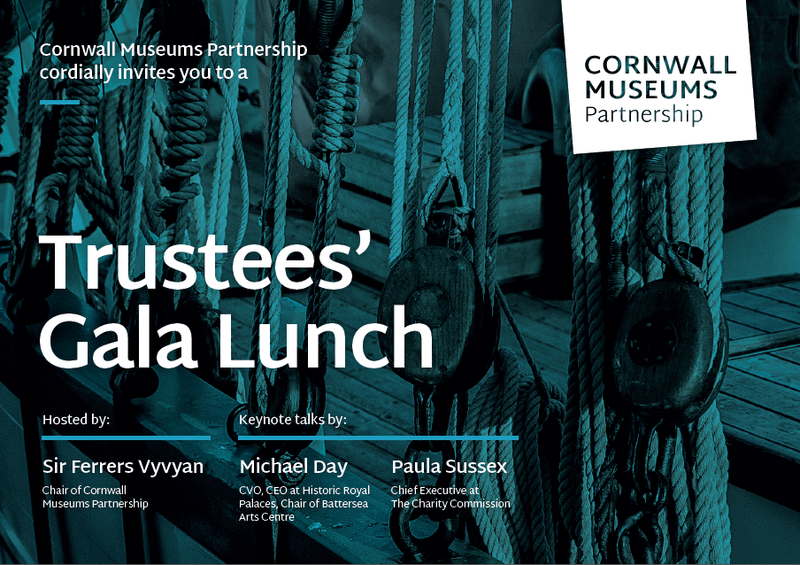 On the 18th of May, Cornwall Museums Partnership hosted its first Trustees’ Gala Lunch in Heartlands, Pool. Over 50 senior decision makers from Cornwall’s heritage sector attended and discussed the vital importance of good leadership to the future of the UK’s museums and galleries. Recent conspicuous failures in governance in the not profit sector headlined by Kids Company, but with some notable difficulties in museums too, have highlighted the need for all Trustees to take leadership seriously. Cornwall Museums Partnership is at the forefront of raising awareness of the need for excellent levels of leadership and governance. The event included two high level speakers: Michael Day, Chief Executive of Royal Historic Palaces, and Paula Sussex, Chief Executive of the Charity Commission. Attendees discussed the need for ongoing trustee skills development in order to help heritage organisations to survive and thrive in challenging times. Paula Sussex reinforced the critical importance of the Board in a charity’s performance, and Michael Day illustrated the importance of strategic leadership and the critical role Trustees can play in fundraising for their charities. Some of the key outcomes from the event included the importance of having diversity on the board, commitment to board development, the significance of establishing a relationship of trust between the Chair and the CEO, and the need to develop of succession plans. 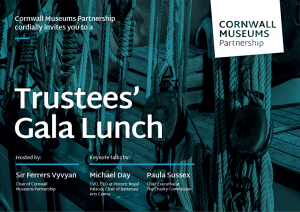 With support from Heritage Lottery Fund, Cornwall Museum’s Partnership are hosting the Trustee’s Gala Lunch on the 18th May at Heartlands. We have secured two amazing and inspirational keynote speakers for the day – Paula Sussex, the Chief Executive of the Charity Commission and Michael Day, Chief Executive of Historic Royal Palaces. There’s also the opportunity for Trustees to be involved in the ‘Manifesto for Leadership Workshop’, hosted by Sir Ferrers Vyvyan in the morning, with a lovely lunch provided by the Red River Café at Heartlands, and really get involved with a Q&A panel in the afternoon for all things leadership. Museums and galleries should all have received 2 invitations for the event, if you don’t think your organisation has, and you’re a Trustee interested in attending please get in touch with Clare Pennington at Cornwall Museums Partnership – clare@cornwallmuseumspartnership.org.uk t. 01209 500750 before the 13th of May.